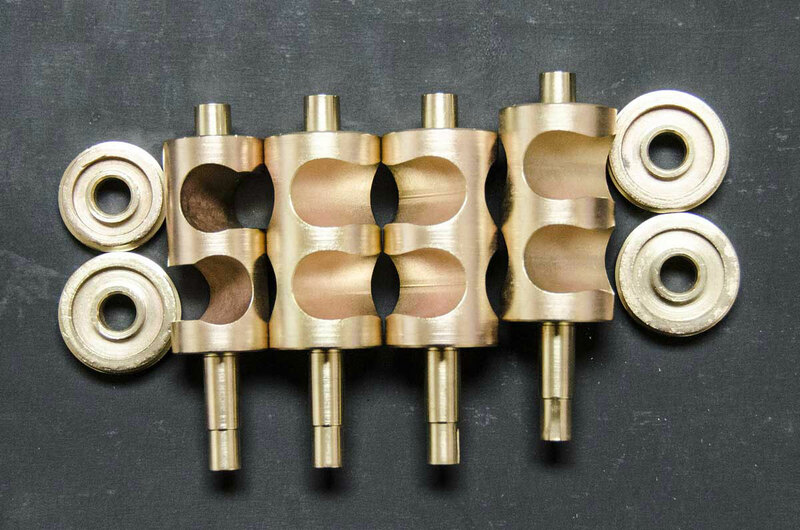 Rotary valves require thicker oil than piston valves. The same reasons for using synthetic oil on pistons also apply to rotary valves. The oil we use comes in a bottle with a syringe type applicator. Unfortunately, even this is not very helpful. To properly oil them they need to be taken apart. 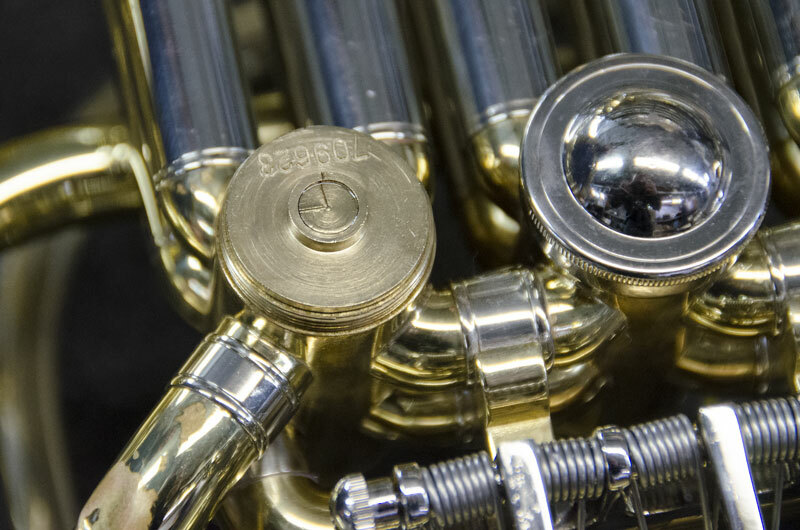 If you play an instrument with rotary valves and are not handy with a screwdriver and mallet, tiny screws and bits of string, your ability to oil the valves is pretty limited. The pictures will help you understand why. A rotor valve has two bearing surfaces. Both must be lubricated for the valve to work properly. The bearing surfaces of the rotor are underneath the bearing plate (underneath the cap) and buried at the bottom of the casing just under the stop arm bumpers. Right away, it is easy to see that getting oil into those places is not for the feint at heart. Without taking the valve completely apart, it is possible to put a few drops of oil on the bearing surfaces. Take the cap off and moving the finger lever, you will see the rotor moving. Put a few drops of oil there. Then, turn the instrument over and put a few drops in the crack between the stop arm (the part that moves and holds the string) and the body of the horn. Wiggle the valve lever to spread the oil. That is all you can safely do. There is a third place that oil is needed: between the rotor and the casing. This area is not reachable except by putting oil down the slide tubes. Dirt and grease sliding down into the rotor ports will bind the valve just as it does with piston valves. As you can see, this is a bit difficult and at best is not all that effective. Getting the oil to where it is needed is quite a challenge. The truth is, it is best to leave lubricating rotor valves to someone confident in taking them apart. 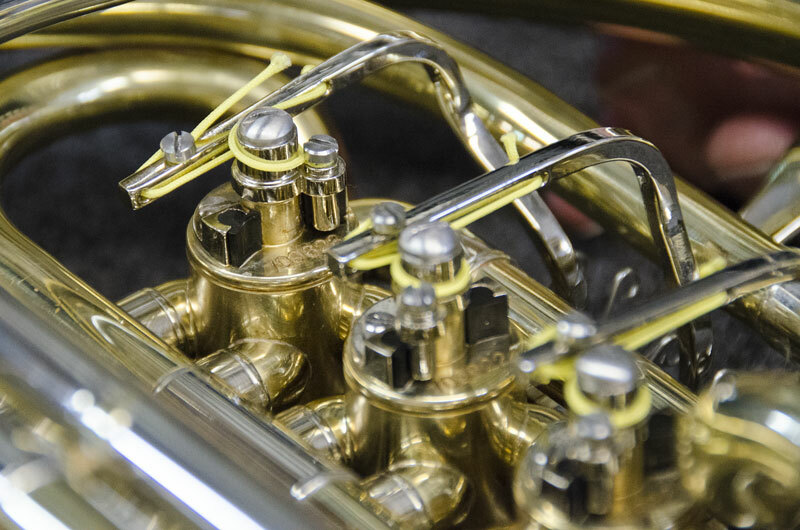 If you’d like to schedule your instrument for servicing, we’d love to help. Please contact us at repair@paigesmusic.com or by calling 1-800-337-0471. As always, please let us know if you have any questions.